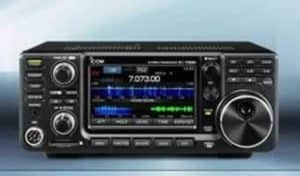 I have been using the new Icom IC-7300 since the first week in April and absolutely love it. It has a very good receiver and I’ve had no overload (OVF) problems at my location. See Sherwood Receiver Test Data. I have received the OVF one time. A neighboring Ham up the street was running 1KW and my beam was pointed in his direction. No problem! I turned my beam and the OVF went away. I’m glad to be able to see the signal in the spectrum scope and at least I know where he is, hi hi. Strong stations 3KHz away on 75 Meters don’t bother me near as much now and neither do external pulse type or random noises. 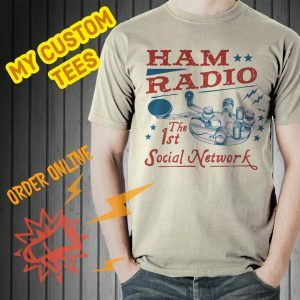 I run a net every Thursday and Saturday morning and normally have QRM from a neighboring net 3kHz away. This radio handles it very well in my opinion. I can pull out weak stations and I’ve made a number of contacts with weak stations that would not have been possible with my Icom 7000. The NR and NB are excellent in this rig as well as the MNF, IF filters and Twin PBT. I’m impressed by the silky smooth tuning dial and intuitive menu system. The Icom 7300 is so easy to use! The LCD touch screen is extremely functional and the spectrum and audio scopes are a big plus. The Icom 7300 puts out excellent transmit audio quality using the stock mic and using my old dynamic mics I have the transmit audio to my liking. I also get excellent audio reports using those mics. Tx audio includes treble and bass adjustments. I have been using the 7300 with PSK31, RTTY (FSK) and JT65. It is an exceptional rig for digital operation. It includes very good filtering and clean output. The 7300 has a fast internal auto tuner, but will not tune a very high SWR. It does what it is supposed to do. It is not as good as my old Kenwood TS-570DG internal tuner, but it performs as advertised and probably a little better. I can hear the fan come on when I key the radio, but it is not too noisy for me. It keeps the rig cool and the rig is very quiet during receive. I had no problem running RTTY (FSK) in a contest. The Icom 7300 stayed cool. The 7300 is compatible with all of the software I’ve tried which includes, HRD, DM780, N3FJP, MMTTY, N1MM Logger+, Fldigi and JT65-HF HB9HQX. I’m running Windows 10 on a Lenovo laptop. I use two cables. The CI-V for rig control and USB for sound card and serial (com) port keying. This setup works great! See my other post. I’ll update in a few months when I’ve done more. Sometimes my radio stays on 24/7 so it won’t take long! Feel free to contact me. One problem I have with the 7300 using HRD is that when I transmit, the radio and HRD disconnect. Everything else works perfectly until I transmit. I am only using the USB connection for phone-no digital at this time. 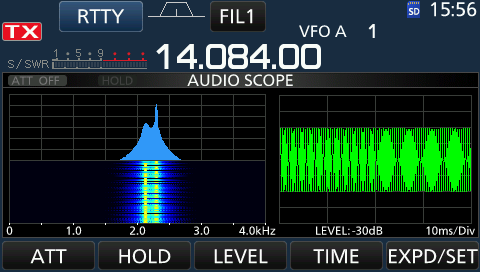 SWR is usually 1.1/1.0, mic gain is 32%, compression is 5 and rf power is 84%. Nice to hear from you and thanks for visiting here. I would suspect the USB cable. I was using a 10′ cable and it gave me problems on 40 Meters. Is the radio grounded? Does it happen on every band? Can you try some ferrite on the USB cable or try a different cable? How about moving the computer further away from the radio? Route the USB cable away from the radio. What happens when you key up with only 5 watts?